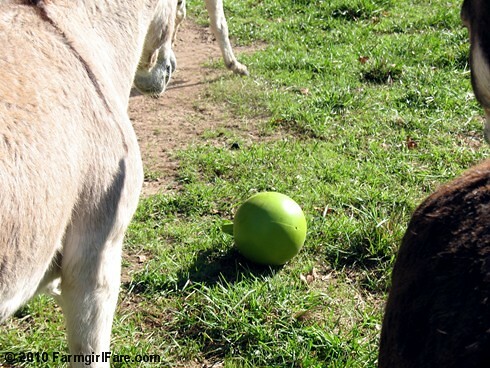 Farmgirl Fare: Tuesday Dose of Cute: Let the Games Begin! Not. 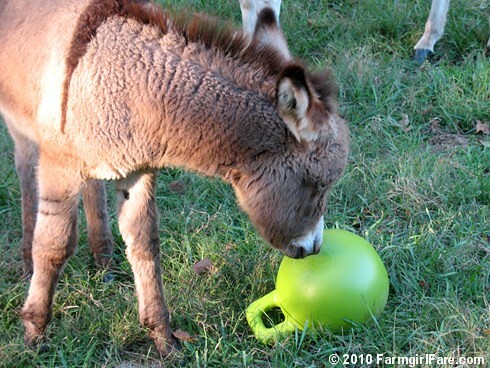 A few weeks ago I bought the donkeys a special non-toxic, almost indestructible, made in the USA, never needs air, green apple-scented ball to play with. And I'm the only one who's excited about it. I should have just baked them a pie. These photos were taken on three different days at four different times. As you can see, we have no takers. I mainly bought the ball for little Gus, who is always trying to get somebody to play with him, but apparently he only likes to play with animate objects. 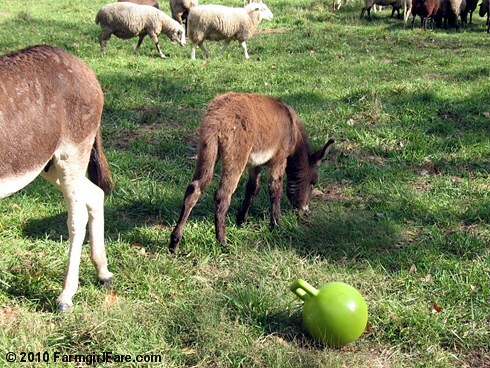 On the one hand, buying a $17.95 ball for the donkeys ranks right up there with building our chickens a little wooden swing in their run, which one of our stupid chicken books said that they would love. At least the swing was free. 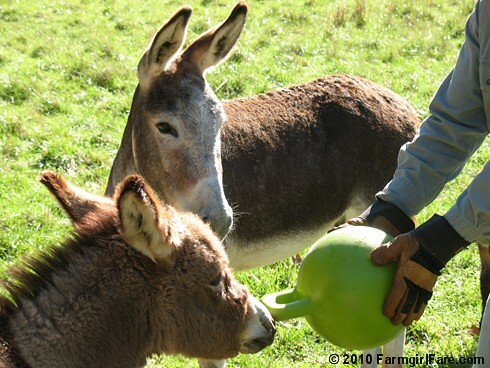 On the other hand, the donkeys are currently living out in the sand field (so named because of its sandy soil), which is about a quarter mile away from The Shack. That means we don't see a lot of what goes on out there. The sheep have been spending most of their time grazing in that field, too, fiercely guarded by Marta Beast and Daisy (when they aren't busy inspecting baby donkeys). 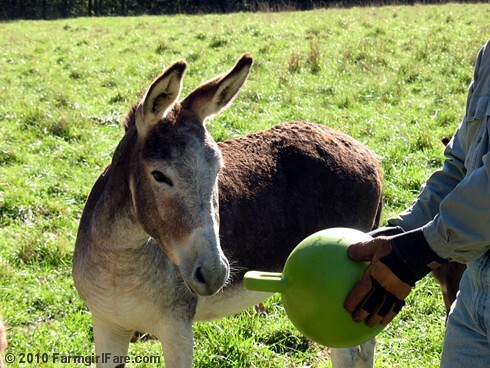 Every day I set the ball in the center of that big dirt circle at the edge of the field (I mentioned that circle in a recent post and then never got around to showing you what it's for, which is donkey dust baths), and every day when I go back out there it's been moved. Not a whole lot, but some. Joe says it's probably just accidentally being kicked by a sheep or a donkey or even one of the dogs. I say, who out there has seen the movie Chicken Run? Remember all that stuff the chickens did when the farmers weren't around? 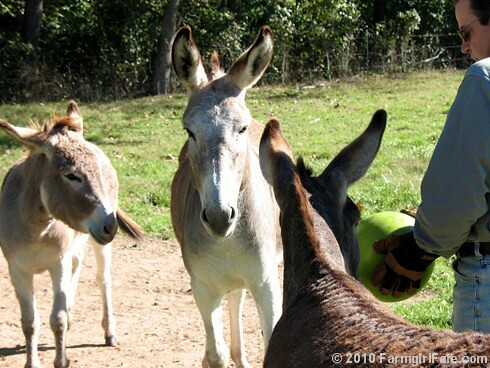 I have a feeling a whole sheep and donkey soccer league has been formed, and as soon as they hear us coming up the wet weather creek bed, Daisy kicks the ball back toward the dirt circle, Marta flops over and pretends she's asleep, and everybody else puts their head down and starts intently grazing. I swear one time I saw a whistle hanging from a string around Marta's furry neck. © 2010 FarmgirlFare.com, the sneaky little foodie farm blog where I've lived with critters long enough to know that anything is possible—and that a lot of stuff goes on behind your back. I'm sure you've seen The Far Side cartoon where the cows are all standing in the field drinking coffee until one of them shouts "car!" and they all go back to grazing. Maybe it smells too good for them? But I quite like your image of the soccer league! 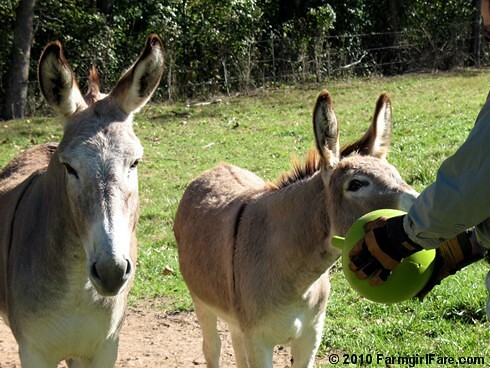 I love the fact that they may be playing with the ball behind your back! LOL is all I can say today. I love your daily dose of cute, thanks for sharing. I love seeing the photos you post every day. Reminds me of when I was young and my brother had every animal imaginable on the farm. My father wasn't a farmer but worked as an environmental inspector for the government. 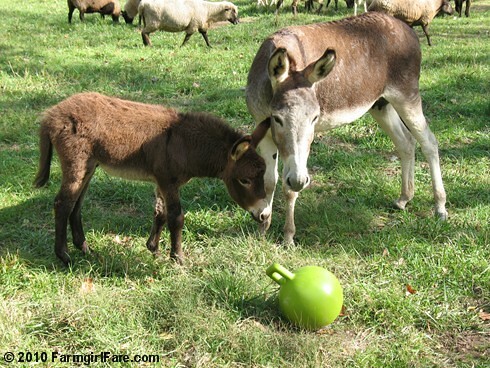 The farm was just a hobby farm - and a large one. There was no end of thrills and problems. For sure they are playing when you aren't around. Being coy and cute is one of their major talents! So much fun! I just love life with all the animals around here. So entertaining. 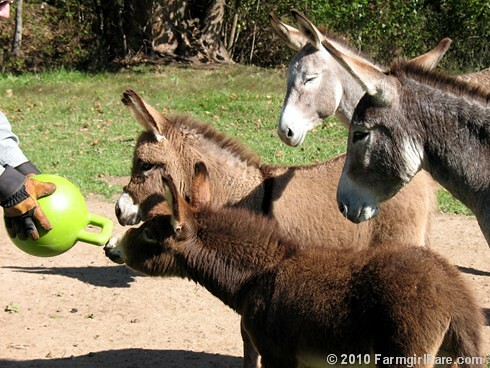 We used to have a few horses at the stables that liked playing with plastic milk jugs we hung from the rafters in their stall. They weren't pastured. If the toy was more like the one for dogs.. where it drops a treat if they roll it around.. that would be more enticing for them! LOL.. the dog toy is called Kong.. what you need is a Donkey Kong! Good choice of toy. It may take a while but I think they will eventually play with it.The hanging idea is a good one. Horses are hmmm more easily distracted lets say. 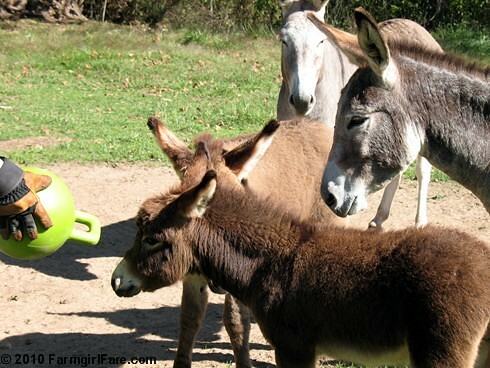 Donkeys are more circumspect. Like will it benefit me, and will it cause work or ecsurtion? As you know this takes a while for decisions be made. 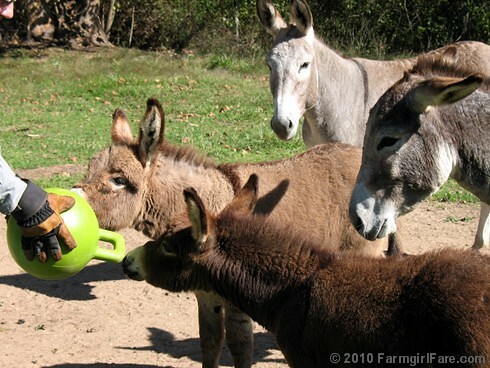 My horse, and mules I know have enjoyed htis kind of ball. Theyy also like Highway Cones as toys. I see them on the road thrown to the side and left behind. I instantly think orphaned and abandoned horse toy. Don't give up it may not have been a total waste. If not Daisy and Marta can use it as a weapon when on duty. 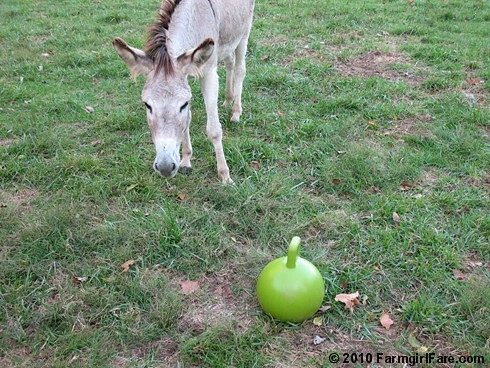 my donkey was frightened of a ball when I put one in the enclosure for him to play with but found an old stuffed toy somewhere and would walk around with that in his mouth shaking it around till he got tired of that. 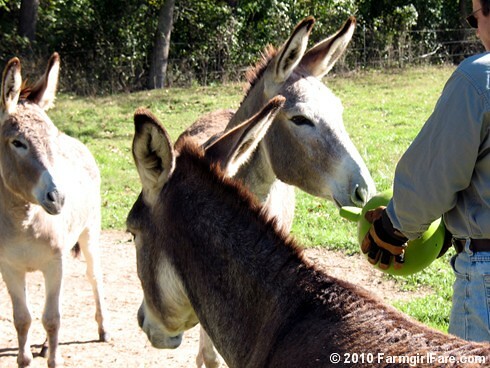 donkeys are just great! They do look interested, at least! Maybe you should leave it on the other side of the fence for a few days in order to encourage desire, then try again.